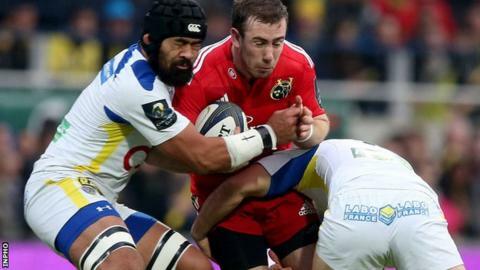 Munster's hopes of reaching the European Champions Cup knock-out stage suffered a massive blow with a second defeat by Clermont in eight days. Ian Keatley's two penalties gave Munster an early lead but tries from Damien Chouly and Noa Nakaitaci helped Clermont to a 15-6 half-time advantage. Chouly scored a second try but Munster gained a losing bonus point with Duncan Casey's try and a late Keatley penalty. Clermont top the pool, a point ahead of Saracens with Munster four behind. Munster were out for revenge after a first home defeat by a French side last weekend and they made a strong start at the Marcel Michelin Stadium, particularly at the breakdown. Keatley's long-range penalty put the visitors ahead after five minutes and he added another as Munster pressed for a try. Clermont hit back with a classy opening try after 19 minutes, surging forward and captain Chouly stretched over for the touchdown although Camille Lopez missed the conversion. Lopez made no mistake with a penalty eight minutes later as Clermont moved in front and Morgan Parra fluffed a penalty from distance before Nakaitaci's superb try in final second of the first half. The wing's mazy run took him past five Munster players before he squeezed over and Lopez added the extras. Keatley reduced the gap to nine points with his third penalty two minutes into the second half. Munster full-back Felix Jones was sin-binned two minutes later after sticking out a leg to halt the run of Lopez as he chased his own kick. Lopez received treatment before kicking over the resulting penalty from wide, although he missed another penalty attempt after 52 minutes. The fly-half was successful with a 58th minute penalty before Fritz Lee fumbled a yard from the try line for the rampant hosts. The third try came seven minutes from time with Chouly going in at the corner from Lopez's cross-field kick. Lopez dragged the conversion wide before Casey gave Munster hope of a losing bonus point, intercepting a pass on 75 minutes and powering over with Keatley converting. And they duly clinched what could be a crucial point when Heatley held his nerve to flight over a long-range penalty in the 82nd minute. Clermont Auvergne: Abendanon, Nakaitaci, Rougerie, Fofana, Guildford, Lopez, Parra, Domingo, Kayser, Zirakashvili, Cudmore, Vahaamahina, Chouly, Lapandry, Lee. Replacements: Stanley for Rougerie (59), Radosavljevic for Parra (65), Chaume for Domingo (69), Ric for Zirakashvili (69). Not Used: Ulugia, Pierre, Bardy, James. Munster: Jones, Conway, Smith, Hanrahan, Zebo, Keatley, Murray, J. Ryan, Casey, Botha, Foley, O'Connell, P. O'Mahony, O'Donnell, Stander. Replacements: Copeland for Stander (61). Not Used: O'Byrne, Guinazu, Archer, B. Holland, Williams, D. Hurley, J. Murphy.